I am honoured to represent the Chief of Army here today at this General Sir John Monash Commemorative Service. A role model whose attributes and style are as relevant today as they were during his distinguished service during World War One. As I prepared for today I asked the question: what is the importance of the day to me and his value to us? It is a beautiful day and we are surrounded by an amazing educational facility. We live in a country where we are safe, where we strive to include the outsider, we assist and care for the vulnerable, and where we endeavor to use our education to better ourselves and the lives of those around us. Remembering a prominent and hardworking citizen who helped make Australia the ‘lucky’ country is important in our quest to ensure his legacy is honoured. General Sir John Monash was born in Melbourne in 1865 and educated at Scotch College and then the University of Melbourne graduating with three Bachelor Degrees in engineering, law and arts. He was Jewish in heritage and many doors in society of those times were closed to him because of this. Sir John was a well educated (and broadly educated person). He valued education and he applied himself to it so that he could better himself. He embarked on a career in engineering with success; he contributed to many community activities and joined the Australian Army (Militia) in a part-time capacity. He was marked for success in all of these varied fields. With the outbreak of the Great War, Monash was promoted to the rank of Brigadier General and appointed as Commander of the 4th Infantry Brigade. His Brigade trained in Egypt and landed at Gallipoli on the morning of the 26th April 1915. For the landing his Brigade was given a sector including responsibility for Pope’s Hill and Quinn’s Post. These names we know today for all of the wrong reasons – the number of young Australian lives that were lost in those locations. After withdrawal from Gallipoli, Monash was promoted to Major General in July 1916, and placed in command of the 3rd Australian Division. He had reflected on his experiences at Gallipoli and set about applying new ideas to warfare that would protect the lives of his men. The Division was involved in months of serious fighting and trench warfare in France from November 1916 until they progressed to full scale operations from June 1917 onward. After his brilliant blocking of the massive German offensive from 21 March 1918, Monash was promoted in May to Lieutenant General and appointed as Commander of the Australian Army Corps. It was during this period that he planned and directed a series of determined and effective actions including the masterful and meticulously planned ‘Battle of Amiens’ in which two German armies were defeated. His successes in the war could be attributed to his pre war study of all the major ‘new’ weaponry that emerged at that time, including the tank and the aeroplane, artillery, machine guns, and decoy targets. He was a great believer in employing modern communications including the radio and gathering information through the use of aerial reconnaissance. This exceptional knowledge and thirst for an understanding of new technology allowed him, in the pressure of the war years, to absorb all the important developments and to apply them in combination on the battlefield. Monash approached battles as he approached engineering projects in his civilian employment---by coordinating all the key elements in great detail. He also understood the broader ramifications of running a huge organisation; he was a corporate thinker. He encouraged a working environment in which innovation was allowed. Monash promoted professional debate. Upon returning from the War, Monash’s energy enabled him to continue with his prominent community involvement and contribution to a number of organizations. His key appointments included: Royal Commissioner to investigate the police strike of 1923; membership of the Commonwealth Defence Council and the Walter and Eliza Hall Institute; service as a Rhodes Scholarship selector, as president of the Australian Association for the Advancement of Science and the honorary Vice-Chancellor of the University of Melbourne. The modern Australian Army continues to be guided by his approach. We believe that including all into the Army that we will have the very best talent (people like Monash) to protect our nation in future. Army uses the Defence, Science and Technology Organizations’ work in close co-operation with troops deployed on operations, to develop and produce new solutions to protect our nation. We continue to be inspired by the idea that learning and the application of knowledge will help keep our soldier’s safe. Many Australian lives were saved because of Sir John’s care for his soldiers in the most horrific of wars. I, like many people in Australia, have family who served under Monash in World War 1. This will almost certainly include some of you in this room. I am moved to reflect that if he was a different kind of person maybe they would not have returned safely back to these shores. Monash was not only a man for his time, but also a man for the future; Monash University is a great example of his legacy to us. A man judged by history as an inspirational leader. His philosophies and ideas are clearly evident today in the embodied character, ethos and values of our modern Army and Nation. A great citizen and a great soldier. Speech by Brigadier Phillip Moses based upon Brief by Roland J Perry, author of “Monash – The Outsider who won a War”, for St Catherine’s, Waverley, 2017. Brigadier Phillip Moses was born on 18th January 1967 in Lae, Papua New Guinea. He attended schools in Papua New Guinea, New Zealand and Australia. He enlisted in 1985 and graduated from the Royal Military College into Ordnance Corps in December 1988. His initial appointment was as an Instructor at the Ordnance Corps Centre followed by posting as a Platoon Commander at Kapooka. On promotion to Captain, he became OIC of Petroleum Platoon 2nd Field Supply Battalion. He concluded his time in the Regular Army as SO3 Operations at Defence National Storage and Distribution Centre. He transferred to the Reserve in January 1994. In the Reserve, Regimental experience has included Operations Officer of the 8th Brigade Administrative Support Battalion and 2nd in Command of the 5th Combat Service Support Battalion. He Commanded this Battalion from 2009 to 2011. Brigadier Moses has had varied Staff appointments. He has served as SO2 Training Development at the Royal Military College. At Headquarters 17th Combat Service Support Brigade he posted as SO1 Projects and Deputy Commander. At Headquarters 2nd Division he has been Aide de Camp and SO2 Operations. At FORCOMD he was LO to projects. At Army Headquarters he held appointments as SO2 Directorate Force Structure, SO2 Health in Land Development Branch, SO1 in Directorate of Logistics and SO1 Reserve Policy. In the Career Management Agency he was Director Projects and Standby Reserve Management. In Defence he project managed Coalition Logistics and was seconded to the Strategic Reform Program. Operational experience has included secondment to Headquarters Special Operations in August of 1999 for Operation Spitfire, and then to Headquarters Force Logistic Support Group for Operation Warden. In April 2000 he returned to Australia as the SO2 personnel and logistics for Operation Gold. Deployments have occurred to Iraq, Afghanistan, East Timor and the Solomon Islands for the purposes of facilitating Entertainment Tours. 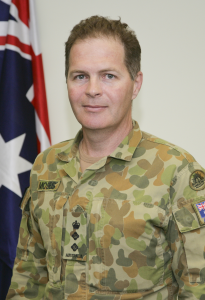 Brigadier Moses was appointed Commander 8th Brigade in January 2017. Brigadier Moses has a Bachelor and Graduate Diploma of Arts (English). Civil employment has included Human Resources for Department of Community Services New South Wales, Executive Officer University of New South Wales and Resources Director at Outward Bound Australia. He currently works as a consultant and author. He has four published novels. Brigadier Moses lives in Canberra with his supportive wife Nina. Leisure interests include photography, bush walking, cycling and kayaking.